ergonomically speaking? Or would it just be awkward? And how much of a nuisance would the cords become? Also, is it okay to have your computer sitting directly on the ground? A bit of a silly question, for sure, but I would appreciate any input! I don't know that the table would be a problem ergonomically, it depends how high it is. You really want the height of the table to allow your arms to bend 90 degrees at elbows and wrists to be straight iirc. As for computer on the ground, I would say that carpet floors its not recommended (I have mine on a wooden board sitting on carpet); but wooden/solid I wouldn't have a problem with - as long as it's sturdy and doesn't vibrate too much. 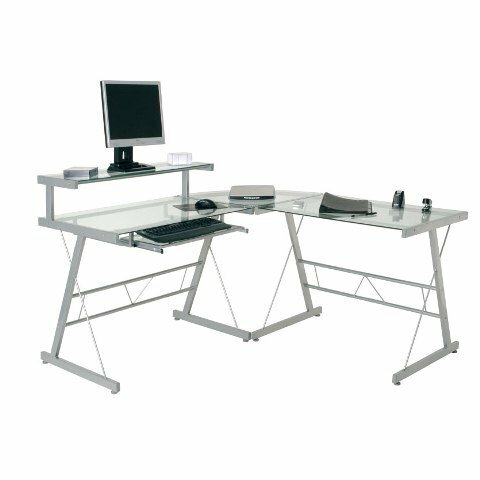 Any desk is fine as long as your chair is height adjustable and you're not too short. Leaving the computer on the floor is fine but it'll be more dusty so you'll have to clean it out more frequently. yes , I have to clean it about once a month and blow it all out :/ . and my table is like a folding card table right now lol its ok just the monitor and keyboard and mouse on it, slightly woblely but it does the job for now. I use one because thats what I have. 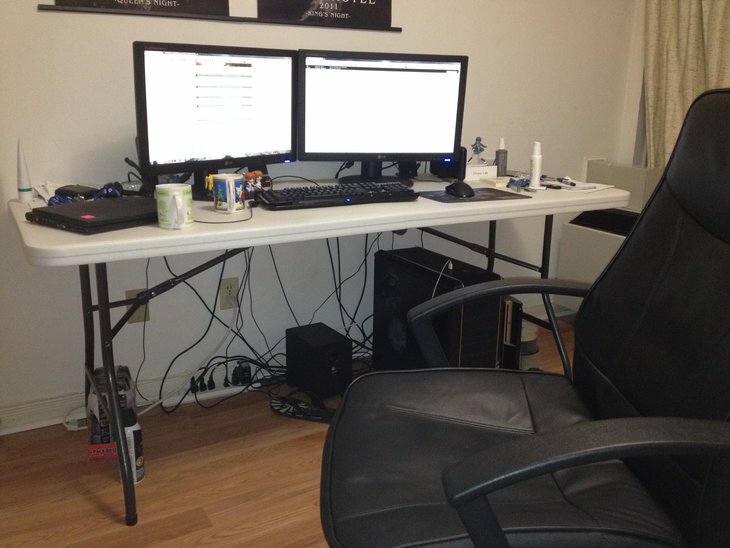 I'm 6'1" and my chair is adjustable but it still doesnt go high enough for the desk to have proper ergonomics. I have to sit on a pillow to be closer to the right height. It works fine other than that though. A folding table beats the piss out of the floor. Aside from that, though, a desk is definitely preferable for serious use. I'm a fan of my big glass corner desk. The only problem is that the wires might get too messy. You need to set it up against the wall (of course) with the CPU outside the table. Also make sure there are no dangling wires under the desk as you are very likely to kick it with your feet causing a restart. I used to use one, it works fine. I used mine back in the days of CRT monitors though, and they will bend the plastic they sit on if they're too heavy. If you have an LCD it will be no problem though. 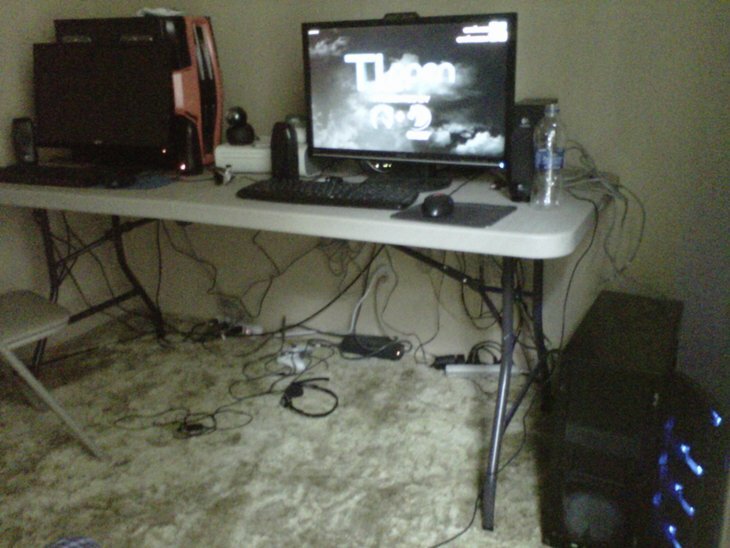 thats the exact desk i ues except.. the one i have was outside for a while and needs to be cleaned... it looks like it was dragged through a baseball field. I love it for all the free flat space I have. The diagonal bars on the side make for decent leg rests for me to stretch my legs sometimes. Calendar"Everyone who has accomplished more than you has no life; Everyone who has accomplished less than you is a noob." | Elem: "nagi is actually really smart"
I used them a while ago, it's good however the surface isn't ideal for soft mousepad tho, some mouses will have trouble with accuracy. Granted, as uncomfortable as this looks (so everyone says) its actually pretty ergonomic and ive had next to no problems with extended computer use ever since. Including posture, since im soo close to my tv, ive learned to sit back or suffer. Seriously dont get one of these please! If you have an ikea around you should go there. You can get the same size table in length that is much much nicer without those bars. Here you can see the difference size table tops. You then buy the appropriate legs that you want for around 10 bucks. Its a super good deal. QCK Mass. Designed especially for that sort of thing. Thicker and heavier cloth surface. I have a desk almost exactly like this, but without the keyboard drawer. Greatest thing ever, IMO. Nice and strong, tons of room, safe surface to take apart GPUs and stuff, and a metal frame I can ground a static strip to if I'm working on something at awkward hours and potentially being careless. 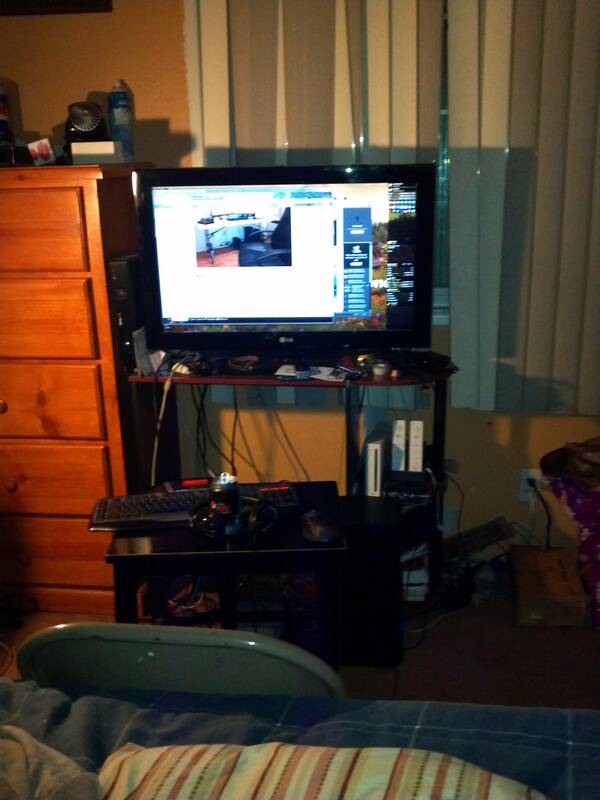 That actually looks really comfortable jingle, its hard to find the right desk that supports monitor height that tall.